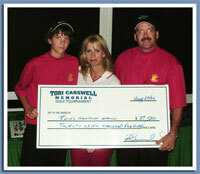 The 2nd Annual Tori Carswell Memorial Golf Tournament was held Saturday, August 27th, 2005. We were blessed once again with beautiful weather. The day went well, and fun was had by all. At the end of it day, $27,500 was raised for Candlelighters and Tori’s Helping Hand. Tori’s Helping Hand is a program within Candlelighters that will assist palliative care children and their families. First place team with a score of 14 under was Kevin Stone, Paul Cohen, Andrew Gervais, Russ DaSilva. Honourable mention goes to Mark Smith, Deb Smith, Brennan Smith & Nathan Callighen at 13 under Rob Carswell, Mark Carswell, Craig Carswell & Tom Weaver at 12 under. The winner of the draw for the Hit the Green contest was Lynne Northcote. Lynne won a barbeque donated by Brown’s Your Independent Grocer in Stittsville. We would like to thank the following people and companies for making our tournament so successful. Without your help, this event would not be possible. Mark Seabrook and Gail Van Denhanenbergh for providing such a wonderful venue to host our event and for all their help. And of course thanks to all of the golfers and our many, many sponsors. A special thank-you to our ’sweetie’ Tori for inspiring us to help others. See you next year on Saturday, August 12, 2006!